A non-ferrous metal is a metal, including alloys, that does not contain iron (ferrite) in appreciable amounts. ... Important non-ferrous metals include aluminium, copper, lead, nickel, tin, titanium and zinc, and alloys such as brass. 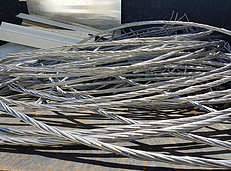 Also see Ferrous Metals or All Metal Types for more information on metals we accept for recycling. 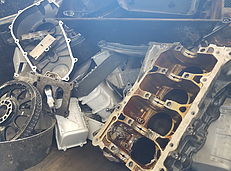 "Whole or particle cast iron auto or truck engines. Transmissions may not be attached. Can also be called auto rotors and drums with plastic bare engine blocks. 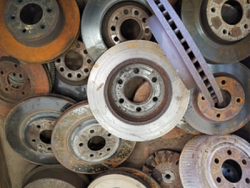 Examples: Car rotors, brake drums, & engine blocks without the pistons & crank." 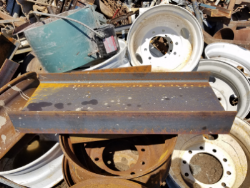 Coil or old water piping, castings or plates from machinery. This also includes Household cast iron items like cast iron bathtubs, stoves, sinks, old fireplace grates and radiators. "Complete vehicles only. A vehicle that has the radiator, battery, catalytic converter, motor, transmission, wheels and tires. 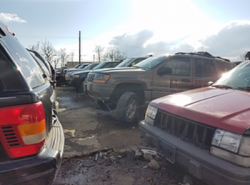 **All vehicles must have a clean title, or junking certificate. 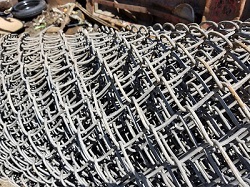 **"
1/4" or thicker steel/iron cut into 36" x 18" or smaller pieces. Example: Steel rims (*without lead wheel weights or the valve stem). Service Area: Cedar Rapids, Washington, Iowa City, Coralville, North Liberty, Hiawatha, Evansdale, Anamosa, Delhi, Mount Vernon, Kalona and surrounding communities.